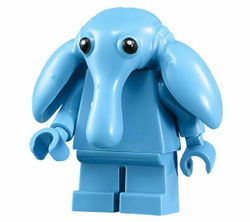 Max Rebo is a Star Wars minifigure released in 2013. Max Rebo consists of blue short legs, entirely blue torso and a headpiece molded in a lighter blue than the torso and legs. The headpiece is a new mould and has white and black printing for eyes, the only printing on the figure. The headpiece has large droopy ears, a long bulbous proboscis, bugged out eyes and small scattered bumps. Max Rebo was a member and the leader of the Max Rebo Band. He and his band provided music and entertainment for Jabba and and those that served him. He signed up to work with Jabba for no pay, receiving an all-you-can-eat meal plan instead, an act that greatly annoyed his fellow band members. This page was last edited on 10 August 2016, at 10:52.